A meeting about Dieselgate between Germany's EU commissioner Guenther Oettinger and Volkswagen, revealed by EUobserver in September, left no written record, further investigation shows. 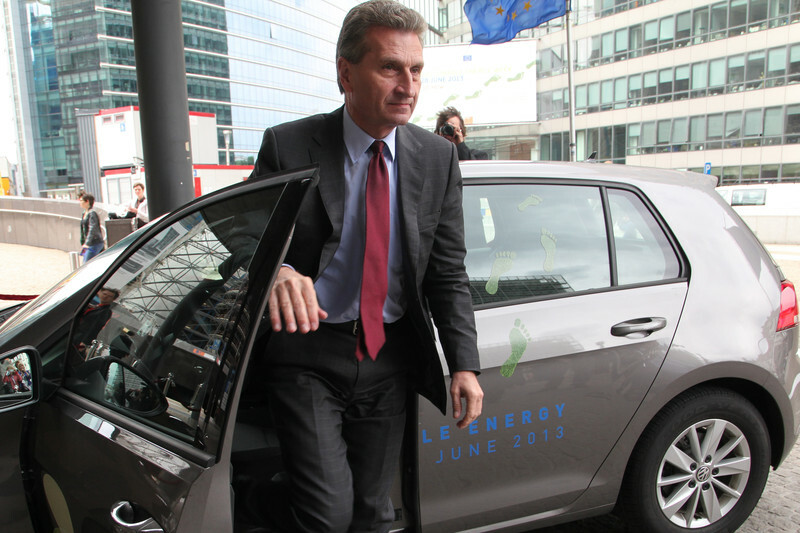 Oettinger and a representative of the German carmaker met on 25 January 2016 in Brussels. The main topic, according to the commission's official transparency register of meetings, was “diesel emissions” - a euphemism for Volkswagen's worldwide cheating on nitrogen oxide emission tests with 11 million diesel vehicles. The topic raised questions because the German commissioner's portfolio is digital economy, and not industry or consumer protection. He was energy commissioner under Jose Manuel Barroso until 2014. EUobserver requested “any minutes, verbatim reports, or other documents with a record of what was said” during the meeting, as well as any other documents related to meetings between Oettinger and VW. The commission sent what it called "the documents requested", which means that no minutes or record existed for the January meeting. The commission did disclose e-mails between Volkswagen and Oettinger's cabinet. On 20 January 2016, someone from Volkswagen asked if the company could have “a small conversation” with Oettinger“ on the margins of our New Year's reception”. A spokesman for the EU commission gave EUobserver a comment by e-mail, but did not reply to the questions: why were no minutes kept? and what was said during the meeting? "Like all members of the college, commissioner Oettinger regularly meets many different stakeholders to discuss issues of importance to the commission," the commission spokesman noted. Volkswagen's lobby office in Brussels never responded to questions from this website. It is unclear why no summary of the meeting was made. In the documents provided, the commission did disclose a summary of another, earlier, meeting. At a lunch meeting on 2 July 2015, three topics were discussed: digitisation of the transport sector and the Digital Single Market (DSM), EU-US trade talks on TTIP, and “emission reduction targets”. Volkswagen told Oettinger that a “95g CO2 target for new cars as of 2020 [is] difficult to reach for VW”. The CO2 target – relating to climate change, while Dieselgate is related to pollutant nitrogen oxides – was agreed by European Parliament and EU member states in early 2014. The private statement, that the target is hard to reach, is in complete contradiction with a press release Volkswagen had issued in 2013, when it said it was “committing to reducing the CO2 output of the European new car fleet to 95 grams per kilometer by 2020”. But why lobby Oettinger, who has nothing to do with emissions standards? It is not uncommon for lobbyists and campaigners to talk to commissioners who are not directly involved in a certain file. Greg Archer of the environmental lobby group Transport & Environment (T&E) met with several commissioners ahead of the publication of a new strategy for low-emission mobility, he told EUobserver. "When a major file goes into inter-service consultation this is standard practice," he said. Inter-service consultation is a process by which a directorate-general which is drafting a proposal, asks other commission departments for comments on the plan. In the context of that strategy, T&E met with climate commissioner Miguel Arias Canete, transport commissioner Violeta Bulc, and Oettinger. There were two reasons to meet Oettinger, said Archer. “He’s German and Germany has disproportionate influence on vehicle regulations – we were particularly keen on explaining the benefits of truck standards where there was a difference of opinion within German ministries,” said Archer. Secondly, Oettinger's “digital economy responsibilities are important for connected vehicles”. No minutes were kept, said T&E. The commission under Jean-Claude Juncker has increased transparency compared to the previous administration, by publishing meetings with lobbyist and including a topic. The fact that a commissioner had a meeting, does not automatically mean he or she was persuaded by the lobbyist. Archer described Oetinger as a “consummate professional politician” who said nothing himself. But despite the new rules, there is still room for a lot of improvement. The 2015 lunch discussion that included CO2 emissions, was filed in the register as being about “DSM, digitalisation in the car sector”. The other topics are not mentioned, and it would not have been public they were discussed, had the minutes not been released after the freedom of information request.